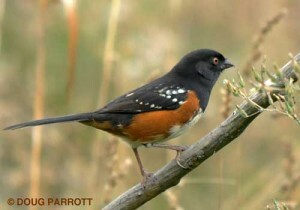 The first time I saw a Spotted Towhee, I thought it was just a weird-looking, tricked-out robin. Black head, rusty-colored sides, a little white here and there – what else could it be? But Spotted Towhees are not even close to robins taxonomically. They’re really a kind of sparrow. A big sparrow. The males have black hoods and backs; the females are browner. Both the male and female help to build a nest near or on the ground out of bark and leaves, well hidden from view. You can find Spotted Towhees all over the Fill, wherever there is brushy cover for them to hide in (they’re a little shy) and leaf litter to forage in (they like seeds best, although they’re not above eating the occasional bug). In fact, when they forage is also when they appear most sparrow-like. They dig into the leaf litter with both feet and then kick backwards, sending detritus flying. This can sometimes make a heck of a racket in the still mornings. If truth be told, when that young cougar was prowling around Discovery Park last year, I would sometimes wonder, when I would hear the crunch of dry leaves near the trail, whether he had managed to find his way over here. But no, it was just a towhee being exuberant. I’m not fond of tea, and I’m even less fond of the Tea Party, but towhees are luckily completely apolitical. Even if they do sometimes appear to be something that they’re not. This entry was posted in Uncategorized on April 17, 2010 by constancesidles.